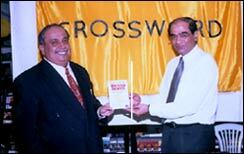 15th February 2002 saw Mumbai welcome Jagdeep Kapoor's best-selling book, 31 BrandServe. Chief Guest, Mr. Anil Gala, Director, Navneet Publications along with Mr.Jagdeep Kapoor. Launched at a function held at the famous bookstore, Crossword, 31 BrandServe was released by Mr. Anil Gala (Director, Navneet Publications). To order the books get in touch with Mr. Anil Gala from Navneet Publications at (022) 4307286 or send an email to anil@navneet.com or anil_gala@navneet.com.